See DM_Studio's entries to the 2016 Winter Stations competition here, here and here. Congratulations to the winners! Driftwood Throne will be featuring in the Vinterbyen (The Wintercity) exhibition at the Danish Architecture Centre (DAC) in Copenhagen in December. The Exhibition runs from December 18th until the end of February, for more details see this link. 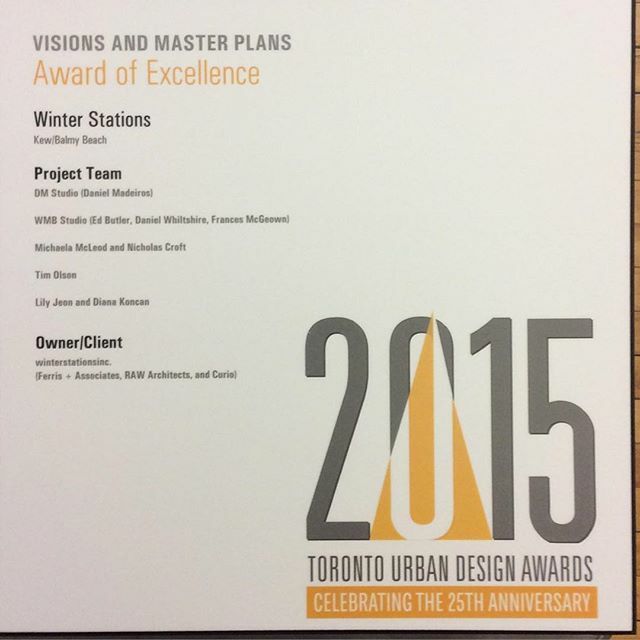 Winterstations has been awarded an 'Award of excellence' in the 'Visions and Masterplans' category of the 2015 Toronto Urban Design Awards. DM_Studio's Driftwood throne was one of the 5 temporary sculptures for Winterstations 2015. Congratulations to all of the Artists/Architects that took part and the organisers; Ferris + Associates, RAW Architects and Curio (WInterstationsinc.). See Driftwood throne project page here. DM_Studio's 2016 competition entry is underway! See DM_Studio's design proposal for this years Scottish scenic views competition, for the amazing Neptune's staircase site at Banavie here. Fire Sticks II has been selected to be exhibited at the annual Sculpture by the Sea competition which will be held in Bondi, Australia in October. See images here. DM_Studio has recently submitted an entry to the Chicago Architectural Biennial Lakefront Kiosk Competition which has received over 400 entries, winner is to be announced late April. See DM_Studio's entry here. Driftwood throne features in Dezeen, Design Boom, Archdaily and Architects Journal amongst many other online and printed publications. See key publications here. 13.01.15 - Winter Stations Toronto competition winner! DM_Studio has been selected as 1 of 5 winter installations on the beach in Toronto for Winter Stations competition - see winning design for 'Driftwood Throne' here. Second entry 'Fire Sticks' was also chosen as a long listed project. The Installation will be unveiled on the 16th February. Model of DM_Studio's Millennium Point Pavilion has been selected to be exhibited in the Architecture section of the 2013 Royal Academy summer show curated by Eva Jiricna. The show will run from 10th June to 18th August at the Royal Academy, Burlington House, London. 20.03.13 - Millennium Point Visibility Competition winner! DM_Studio in collaboration with Jonathan Schwinge is the winner of Millennium Point visibility competition. See winning design here. DM_Studio is shortlisted for Millennium Point Visibility competition, shortlist includes MAKE Architects and BDP.